The aim of our first few posts will be to help readers gain an understanding of who were are, our goals as farmers, and why we chose our particular operating methods. There is a statement I've heard quite a few times that goes: "You can't switch to no-till until Dad is in the ground." This adage implies a reluctance to switch tillage practices amongst the older generation of farmers. Conventional tillage is what previous generations have practiced, and it's worked for them, so they see no need to change. There are some seasoned farmers who practice no-till but they are the minority, especially in southwest Minnesota. Conventional tillage does have some benefits: it dries the soil and can allow for earlier planting, while fall tillage buries crop residue and preps the soil for spring tillage. 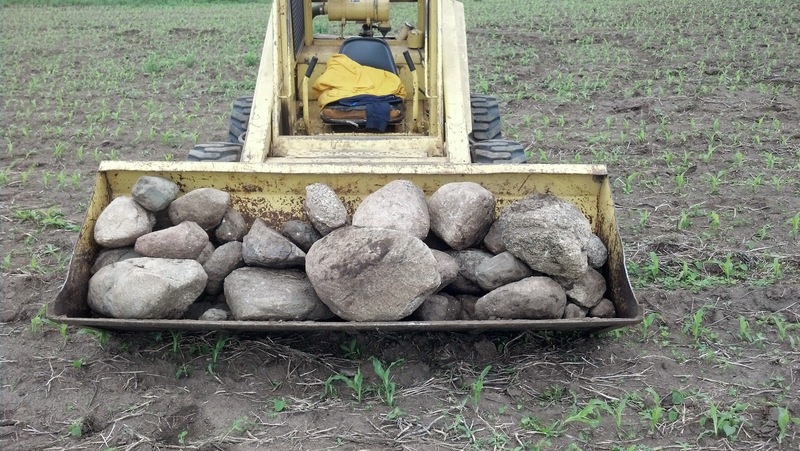 Every farmers favorite job: picking rocks. dominant practice in our area is conventional tillage and a corn/soybean rotation? The answer is simple: money. That statement may make me sound greedy or shrewd, but hear me out. Economics drive change. I did not grow up on a corn/soybean operation; I grew up on a farm that raised cattle and the hay to feed them. I simply didn't know any better. I considered tillage an integral part of farming because that's what everyone else was doing. Fall tillage in 2011 was the catalyst for us to look at no-till. We were in a dry year and pulling the ripper through corn stalks that fall was absolutely awful. It felt like I was ripping concrete, and it took its toll on the equipment. We spent over $1500 alone replacing ripper points on a single 135 acre field, plus the increased fuel consumption, other repairs, and lost time. Those kinds of economic impacts can produce change overnight like it did with us. The lingering reminder of that fall still haunts me in the form of rocks. No one likes to pick rocks, but hilly land like ours is already prone to having them. We pulled up an enormous amount of rocks doing tillage -- so many that I considered attempting to sell the large ones to landscapers in the metro area. After doing some research during the winter, we first no-tilled one field of corn in the spring of 2012. Multiple people told me it was a bad idea and wouldn't work. The yield was comparable to the previous year, we had avoided two tillage passes, and significantly reduced our input costs. All of our ground was no-tilled starting in 2013 and the first major advantage I saw came in the spring of 2014. We had an exceptionally wet spring and I noticed huge washouts and gullies in others' conventionally tilled fields. Meanwhile, even though our land had more slope there was no soil movement or erosion. Soil is a resource and its loss costs everyone money not just the farmer. The loss of highly productive topsoil and its nutrients costs farmers; while increased water treatment, river dredging, and environmental impacts cost everyone money. Our field after heavy rain. No soil movement. Conventionally tilled field across the road. Not the best picture but notice the erosion. Here is a recent article at Agriculture.com about some of the costs of erosion. Economics may have been the initial driver for us to switch to no-till, but seeing an increase in soil health and a reduction in erosion is why we decided to sell the tillage equipment and commit 100 percent. As a farm family that also has jobs off of the farm, no-till also means less of our already limited time is spent in the field. We know that no-till isn't without it's faults. Many studies show that the soil takes longer to warm in the spring and more fertilizer is required. We've simply found that our soils perform much better without tillage, and retaining more moisture has improved our crops. No-till is only a piece of the bigger picture of sustainable soil management, but starting no-till spring-boarded our move in a different direction with our farm practices. Finally, if it takes hundreds of years to make one precious inch of topsoil, I don't want to watch it wash away in one afternoon of rain.